Both the AU Pack and UK Pack are made and distributed by Zoetis (formerly known as Pfizer) and the contents are otherwise exactly the same. We have been using Revolution for several years. None of our dogs has had fleas and have remained protected from heart worm. It is wonderful to use a product that provides so much protection! The vials make it easy to dose each animal. I highly recommend this product. Revolution is exactly what it is!! I had a friend tell me about this product. 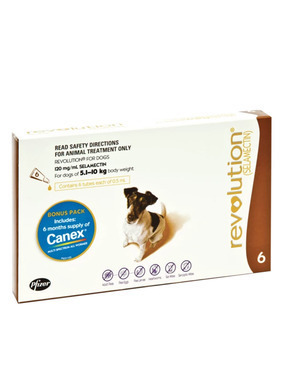 I ordered right away and I have just reordered Revolution for both my cat and dog. They have been free from parasites since I started putting this product on them. I love the small easy to open container and I can usually just pet them and they don't even know that they are being treated. Once they feel the cool liquid on their skin, and start to bolt... I am done. No trauma, no fuss, one product to protect them every day. I tell everyone who will stop long enough to listen about this product. Thank you for carrying this product so we can live with our buddies and invite them to bed with us and never worry that I will get fleas!! This has been the best and easiest product to use to control fleas on and off my cat. It gives me great satisfaction and peace of mind for the health of my cat. I do not worry about where my cat goes outside and what she might bring into my home. I am 100% confident in this product to keep my cat and my home free of unwanted and potentially harmful pests. Wonderful price and easy to order. Thanks to Joe's Pet Meds. Love you guys! A friend told me about this product and I bought it to use on both my dog and cat a few months ago. I love the convenience of on product for it all!! I also treat a stray cat. I am so busy and this saves me a lot of time and money!! I recommend it to anyone who has pets. I can't say enough good things about this product!! This is a wonderful product that was recommended by the cats previous owner. We have been using it for years. We try to give it to her on the same day every month. The cat has done very well on this product and the peace of mind knowing that the few times she does get outside she isn't picking up something is well worth the money. We usually get the 12 month supply as that way we don't accidentally run out. Been using Revolution for 4 yrs. now for my cat ,works great , keeps her from scratching so much . I've used Revolution from Joe's for both my indoor cats and the dog for years. None of them have had a flea, ear mite, or worm problem and they all get excellent reviews at their annual checkups. (I'd know if there was a flea problem; I'm apparently biting insect dessert.) I particularly like the nearly full-spectrum parasite control that this medication provides. If it also eliminated tapeworms I'd be ecstatic since some of the cats don't like Pill Pockets and are savvy enough to recognize other pill-hiding methods. The procedure to ensure ingestion of generic Drontal tablets sometimes requires extensive time, effort, gymnastics, and the occasional payment in human blood. Joe's prices are excellent and the service has always been reliable. I started getting this for my cat and it has done wonders for her flea control. I've been using Revolution on my 45lb English Springer for 5yrs. Every month he gets a dose that is sold for dogs in the 20 - 40lb range ( red box ) this is enough medication to keep him happy and l don't like the risk of over medicating so we're both happy. Hi, I'm please to say I received my order of Revolution for cats in a matter of 10 days from time of placement of order to delivery. Joe's is perfect for our pet's needs and delivery for the 2 times we have ordered has been great!!!!!! Thank you for your fast service for the needs of our pets.